Figure 440. Bark of Dog. 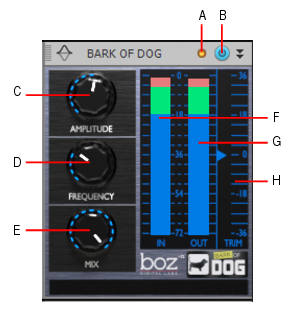 The Bark of Dog ProChannel module by Boz Digital Labs is a high-pass filter with resonance that can add lots of energy to the low end of a track. It lets you boost the low end while still keeping it under control. Well-know for creating the famous “Voice of God” vocal effect (hence the tongue-in-cheek name “Bark of Dog”), Bark of Dog is also great for “tuning” bass or kick drums to make them stand out in a mix. Although most digital equalizers have a resonant high-pass filter, Bark of Dog’s intuitive controls make it fast and easy to get the desired result without thinning the sound. Use Bark of Dog to make voice, bass, kick, piano, and more come alive with a deep and clear low end. Clipping LED. Shows if the input signal to the Bark of Dog module is clipping. If there is any distortion in the ProChannel signal chain, the clipping LEDs let you identify where the clipping occurs. Bark of Dog enable/disable . Enables/disables the Bark of Dog module. Amplitude. Adjusts the resonant frequency level. Turn it up for a more resonant boost, and down for less. The valid range is -6.0 dB to 20.0 dB and the default value is 1.0 dB. Frequency. Controls the high-pass filter frequency, and thus where the resonance occurs. The valid range is 20 Hz to 2,000 Hz and the default value is 79 Hz. Mix. Adjusts the blend of emphasis compared to the dry signal (fully counter-clockwise is fully dry, fully clockwise is maximum effect). The valid range is 0% to 100% and the default value is 100%. Input Meter. Displays the pre-processing signal level going into Bark of Dog. Output Meter. Displays the post-processing signal level. Tip: For some cool wah sounds, turn Mix and Amplitude up all the way, then automate the Frequency parameter from about 50% to 100%.